If you were to have asked me to describe a remote tropical island before this trip, I would have said uninhabited, white sandy beaches, calm, perfectly blue waters, lush green vegetation going right up to the beach with a few coconut trees sprinkled in. That description fits the island of Orona pretty perfectly. It is a very beautiful island. Similarities to Kanton are obvious. Both have the same general shape of a ring of land around a large lagoon in the center connected to the ocean. Orona also has also been greatly affected by humans, but not in such an obvious way as Kanton. During parts of the 19th century there was a copra plantation on Orona. Many coconut trees were planted and still remain in very good health. They are very clearly now the dominant plant species on Orona even though before the plantation, likely few to none of them existed here. Until twelve years ago, the coral reefs would have fit right in with the ideal description for the rest of Orona. The coral bleaching event of 2002 hit especially hard at Orona and is still not in very good shape. There are massive heads of dead coral, with lots of algal growth on them. Our landings onto the island consisted of sliding up stretches of smooth bleached coral. It is clear that the reef here used to be magnificent. There is recovery in many places, but still a long way to go. 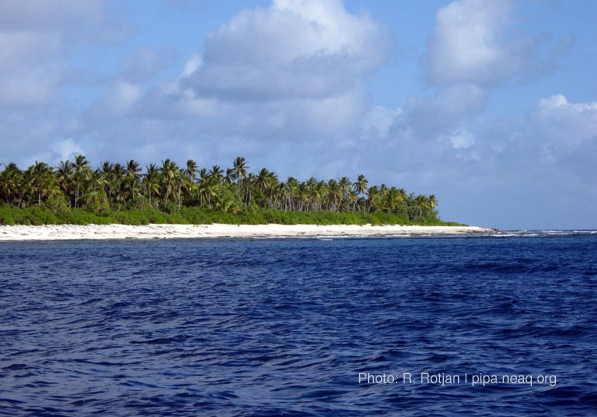 One of the reasons Orona, like most of the Phoenix Islands, has been able to recover is the presence of deeper reefs farther offshore, which were not affected by the bleaching event in 2002 or the smaller ones since then. Having another reef close by is critical to recovery as it can be a source of larval coral and other animals important to the reef. The fact that the deeper reefs have remained unaffected by the recent bleaching events is encouraging for the long-term health of the coral reefs in the Phoenix Islands. With ocean temperature rising these bleaching events will only become more common, but hopefully the deeper reefs remain healthy and can always help in recovery and restocking. 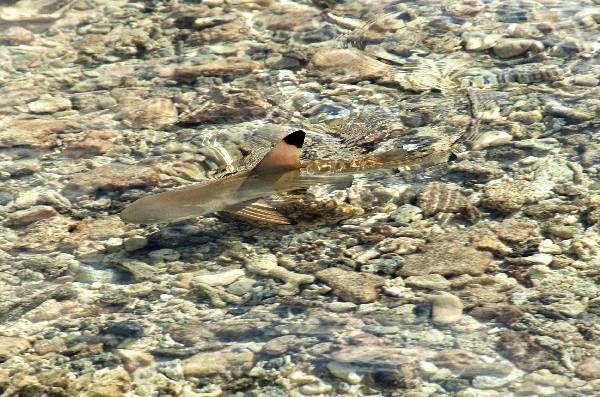 A small black tip reef shark in the shallows at Orona. at the surface of the water so perfect viewing conditions for something no one expected to see. It was very cool. seamount on our way there.